We love the concept of spiral curls because it adds volume and keeps the hair out your way. We chose this shot of Solange because she is becoming a hair enthusiast that we love. Curls do not have to start from the scalp, they can also be at the ends of the hair only. 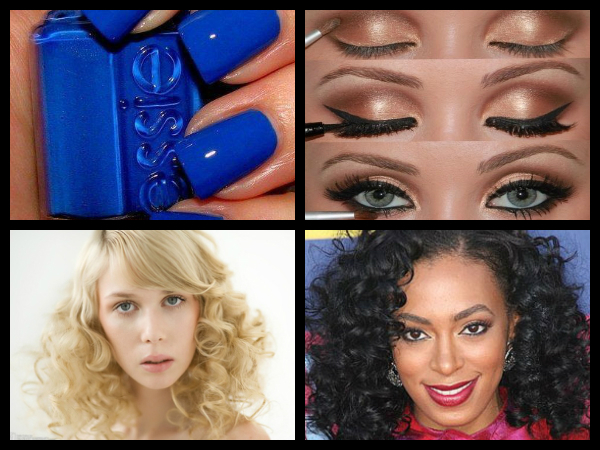 Which ever you choose, we think a royal blue nail polish and a light gold eye makeup will compliment anyone well. Try to find the right shade of gold for your complexion. 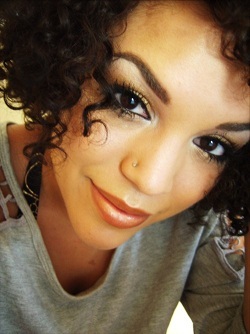 The gold eyeshadow with black eye liner and tamed, full eyebrows will attract anyone. We chose royal blue nail polish by Essie because it adds the pop to your look and maybe even your wardrobe. These finishing touches will make the day better. The final look for the week, a soft looking, beautiful woman.